A man’s quest to find answers for those who are haunted by the past leads him deeper into the shadows in this electrifying novel from the New York Times bestselling author of Promise Not to Tell. Jack Lancaster, consultant to the FBI, has always been drawn to the coldest of cold cases, the kind that law enforcement either considers unsolvable or else has chalked up to accidents or suicides. As a survivor of a fire, he finds himself uniquely compelled by arson cases. His almost preternatural ability to get inside the killer’s head has garnered him a reputation in some circles–and complicated his personal life. The more cases Jack solves, the closer he slips into the darkness. His only solace is Winter Meadows, a meditation therapist. After particularly grisly cases, Winter can lead Jack back to peace. But as long as Quinton Zane is alive, Jack will not be at peace for long. Having solidified his position as the power behind the throne of his biological family’s hedge fund, Zane sets out to get rid of Anson Salinas’s foster sons, starting with Jack. 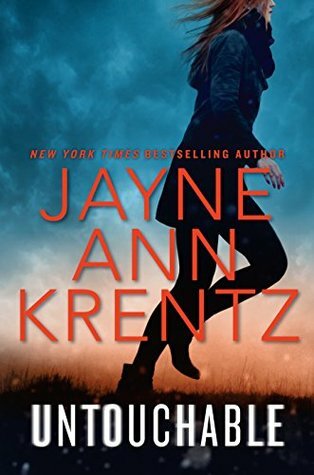 Untouchable by Jayne Ann Krentz is one of the most amazing romantic suspense novels I have read. It has everything I looked forward to reading. The sense of danger, suspense, and romantic elements were played out well. I easily was swooped into the characters’ back stories. What made them who they are now…and that was another bonus. Jayne Ann Krentz made protagonists that lured me into the plot. They had this connection no matter how strange and they trusted their gut feelings. Especially, Jack. He’s so different from most heroes. He doesn’t pack a gun, never shot anyone, and packs a hot body. But most find him crazy. He has this gift. One that helps him solve multiple cold cases and maybe, it will help him catch the bad guy. A serial arsonist is on the loose and Jack and his adopted family have been trying to trace the ghost. But now, there might be a new trail to follow as he helps the woman he falls in love with. Winter is another great character. She too has a gift in a way. But it’s more of a skill than a gift. She can hypnotize others. Not everyone can be hypnotized but most of the people Winter runs into can be. And when living in a dangerous world, she needs it more than ever. Overall, Untouchable, was an exciting journey. The emotional tolls were pulling at my heartstrings. I especially liked it when the good guy put a reassuring hand to comfort a killer as he dies. It was humanity at its best moments. Even the bad guy couldn’t fathom why the cop was giving him kindness as he was dying. I highly recommend this novel to all readers of Karen Harper, Sharon Sala, and J.T. Ellison.